Think about the last time you saw your favorite actor in a film or TV show. Directors will take every chance they can to show off how flawless their leading role’s smile is just to get you to pay closer attention to them. 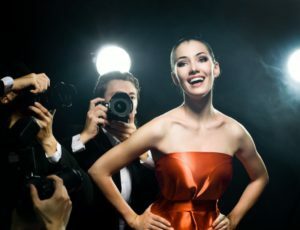 Having an imperfect smile can be a huge distraction for any audience, so it’s worth exploring which celebrities are best known for their smile and how they got the Hollywood treatment. Tom Cruise – One of the biggest actors in Hollywood today, Tom Cruise used to have multiple misalignments and gaps in his smile. After undergoing Invisalign treatment and teeth whitening, he decided it was time to upgrade to a full set of veneers for the true Hollywood look. Kate Beckinsale – Best known for her roles in “Underworld,” “Van Helsing” and “Pearl Harbor,” Kate Beckinsale upgraded to a top row of veneers in 2001. Now her smile shines incredibly well. Hannibal Buress – Comedian and actor Hannibal Buress used to have multiple gaps in his smile, but after accepting multiple TV roles, he started to land more movies with A-list actors. At this point, he decided it was worth it to explore cosmetic dentistry and chose veneers to make his smile look red-carpet ready. Teeth Whitening – Whether you’ve got stains caused by coffee and wine or years of staining to address, your dentist offers it both in-house and via take-home whitening kits. ClearCorrect – When you don’t want to make dramatic changes to your appearance but still realign teeth, clear aligners can get the job done in less time on average. Porcelain Veneers – To hide virtually all issues in your smile, whether it’s cracks, chips, discoloration, excess gum tissue, gaps, or misalignment, these wafer-thin sheaths of porcelain will get the job done. It’s also one of the most popular treatments the big stars pursue! Are you ready to give your smile the Hollywood look it deserves? Don’t hesitate to schedule an appointment with your cosmetic dentist in Waco to learn more about the process! Dr. Rick Cofer offers multiple treatments to make your next formal appearance one to remember. After earning his dental degree and opening the practice, he began providing the Waco community a wide array of dental services all conveniently located under one roof. To learn which cosmetic treatment is right for you, schedule a smile makeover consultation with him through his website.